Virtually all boats under 40 feet or so that have an electrical system operate at a nominal voltage of 12 volts. That is, they use a battery that has a fully-charged potential of 12.6 volts, and the loads and charge devices that are installed on the boat are designed to operate between roughly 12 and 14 volts. The main reason for this is due to boats having used automotive- and industrial-based components which are also based on a 12 volt standard. As boats get larger—say in the 50–60 foot range—and operate DC loads which require more power with wire runs getting longer, 12 volt systems start to become inadequate or at least challenged. That’s because it becomes increasingly difficult to avoid voltage drop—the nemesis of boat wiring systems—which can make electrical devices function less efficiently than you’d like. Voltage drop occurs due to the electrical resistance in wires, connectors, switches, and other conductors in an electrical circuit. No component is immune from contributing to this phenomenon, but voltage drop can be measured and managed, and correctly-engineered boats do not usually suffer from it. For example, let’s imagine a simple electrical circuit with a battery, bilge pump, wires, and a switch (and for the moment, let’s assume that the switch has no resistance and does not contribute to voltage drop). Bilge pumps of a given capacity will use a DC motor that consumes a certain number of watts to operate; in this case, we’ll assume the pump consumes 240 watts. In a boat with a 12 volt electrical system, this pump would draw 240 watts ÷ 12 volts = 20 amperes of electricity. In the case of a bilge pump, we obviously want it to pump as much water as possible, and incremental voltage drop will cause lower performance (less water pumped). The American Boat and Yacht Council (ABYC) E-11 standard recommends no more than a 10 percent voltage drop for this type of circuit and points the installer to Table X, where the recommended size of wire can be determined. But there’s one more thing that we have to know before selecting the correct wire: how long is the run from the battery (or switch panel) to the pump, and back? Every foot of wire adds a small amount of resistance, and resistance causes voltage drop. Larger wires have less resistance, just as larger hoses have less resistance when pumping water. Since we’ve got a 50 footer, let’s say that it is 15 feet from the battery to the pump, and 15 feet back from the pump to the battery, for a run of 30 feet. Looking at the intersection of 20A and 30 feet, 12 gauge wire is recommended to keep the voltage drop under 10 percent. (As a brief aside, we can calculate the voltage drop in this circuit if we know the resistance per foot of 12 gauge wire. Our catalog lists the resistance as 1.75 ohms per 1000', or 0.00175 ohms per foot. Applying the equation V (voltage) = I (current) x R (resistance), we get V = 20 amps x (30' x 0.00175) = 1.05V, which is less than 10% of our 12 volt circuit). 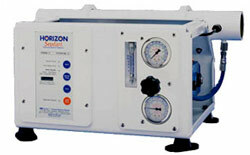 Large watermakers draw half as many amps at 24 volts as at 12 volts. But what does this have to do with 24 volt systems? Let’s calculate the wire size for the same pump in the same boat, but this time let’s assume that the boat has a 24 volt system. That means that the same 240 watt bilge pump will draw only 10 amps ( 240 ÷24 ), and that a 10 percent allowable voltage drop will be 2.4 volts (24 V x 0.10). Once again, referring to the ABYC Standard E-11, Table X, it recommends wire as small as 18 gauge to power the pump. (As it turns out, ABYC doesn’t allow current carrying wires this small except under certain circumstances, so we’d upsize to 16 gauge wire). It’s lighter, so your boat is more efficient. It’s smaller in diameter, so it’s easier to run in tight spaces and around corners. Bow thrusters often have long wire runs. The justification for using 24 volt equipment on your boat gets more compelling as the size of the DC loads increases. Items like windlasses, large watermakers, bow thrusters, and large inverters draw so much power (and may be located far from the batteries) that using adequately-sized 12V wiring becomes impractical. 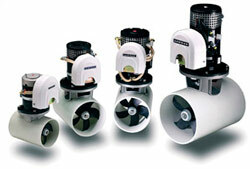 Imagine installing a beefy 1,800W windlass on a boat where the wire run will be 48 feet (24 feet up and 24 feet back). Assuming a 10 percent voltage drop, the 12V version will have to be supplied by 2 gauge wire. The 24V version will require 8 gauge wire. The weight savings in wire alone will be about 7lb. The design rule is that for equivalent performance, wires in a 24V system require 25 percent as much cross-sectional area as those in a 12V system, which translates to a savings (in this example) of roughly 75 percent. Why not use 24 volts for all boats? So why aren’t all boats, big and small, wired with 24V systems? We guess that the main reason is that so many more products are available in 12V versions, especially in categories like pumps, electronics, inverters and chargers. Also, 12V systems require a single automotive-style battery to make them operate. 24V systems require two 12V batteries in series, which increases the weight and volume of the battery bank. Plus, the advantage of using smaller wire is only realized when the currents are large or the wire runs are long. Small boats can use 16 gauge wires for most of their circuits and stay within ABYC limits. Voltage converters let you run a dual-voltage system. 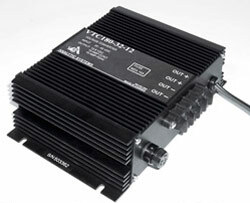 Use a 24V to 12V converter that can power your 12V products. This might be a very small (10A) device to power a single electronic item, like a VHF radio, or it could be a large converter (50–100A) which would power many systems throughout the boat. Once again, as power consumption for electronics increases (a SSB draws 30A at 12V when transmitting), this option can require larger converters, which may not be electrically “quiet” and thus may interfere with the very loads they are powering. All DC to DC power converters should be listed as FCC Class B, meaning that they produce very little interference. 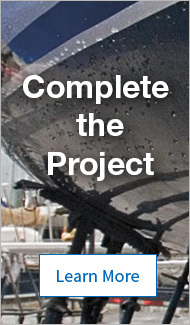 Install both a 12V and a 24V system in the boat. This generally requires two alternators, two battery banks, two distribution panels (or two delineated areas of a single distribution panel), and two battery monitoring systems. And, as mentioned above, dual voltages may reduce the redundancy in the vessel systems if one battery bank fails. As gasoline, diesel and copper prices rise, and as the desire to have powerful electrical devices on board climbs too, using a higher system voltage can save money and weight on larger vessels. While it may increase the complexity of the vessel’s electrical system, it can allow the use of DC loads which would otherwise not be accommodated. Ensure that you plan for redundancy in your design, however, so that you can start your engine and run 12V items if the 12V bank fails, while you also have a solution to power your 24V loads if you have a 24V bank.